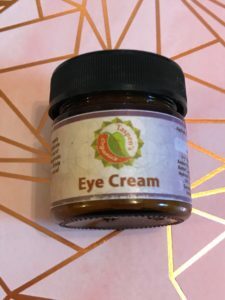 I found this new eye cream at a market in Denver, CO. I am always in search for a great eye cream. I really love to find formulas that help with puffiness and dark circles and give some hydration around the delicate eye area. This was a bit pricier then I am used to paying($85), but the payout and the longevity of this product is amazing! You only need a small amount, less than a pea size…a little bit goes a long way. The rep for the company had said, this should last a full year! I was sold and it smells so fresh and filled with oils. Immediately, when you put it on around your eyes, you feel like it’s making a difference and I love the hydration and it feels so nice! This is filled with anti-inflammatory herbs and essential oils. This is loaded with: Sweet Almond Oil Infused with Arnica* & Calendula Flowers, Mango Butter, Aloe Vera Gel, Rose Hydrosol, Spring Water, Jojoba Oil, Tamanu Oil, Argan Oil, Rosehip Seed Oil and many more ingredients. Lots of emollient ingredients and anti-inflammatory. I really like this formula and this def worth the price! I would def purchase this again.